Should you cut out bread to stop bloating? The Eatwell Guide shows how much of what we eat overall should come from each food group to achieve a healthy, balanced diet. 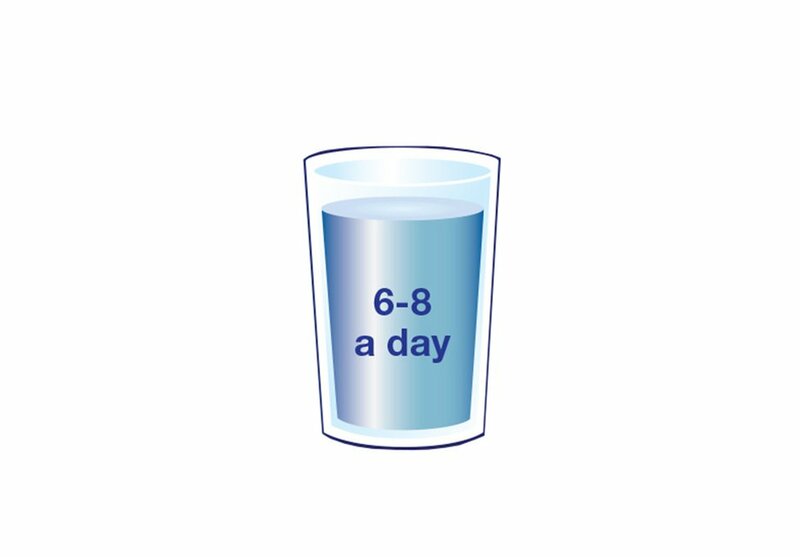 You do not need to achieve this balance with every meal, but try to get the balance right over a day or even a week. Most of us still are not eating enough fruit and vegetables. They should make up over a third of the food we eat each day. Aim to eat at least 5 portions of a variety of fruit and veg each day. Choose from fresh, frozen, tinned, dried or juiced. Remember that fruit juice and smoothies should be limited to no more than a combined total of 150ml a day. 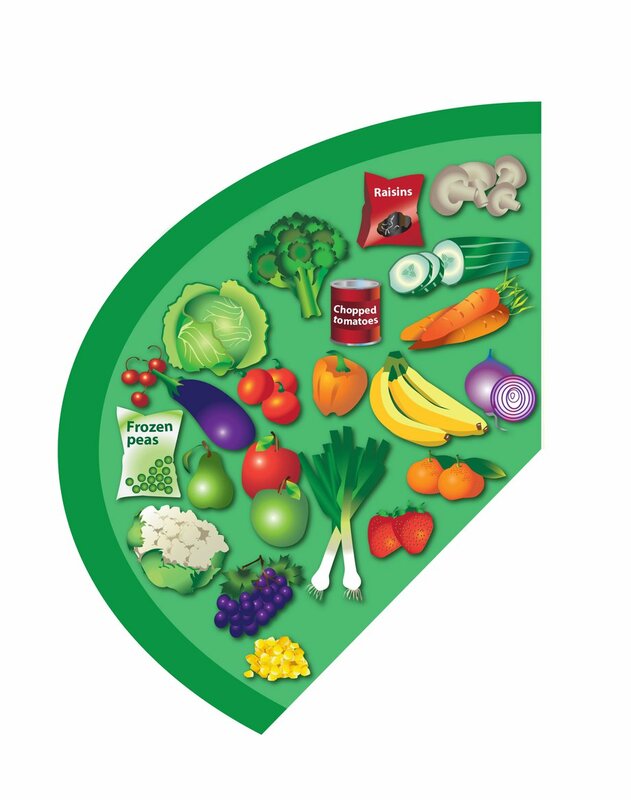 Fruit and vegetables are a good source of vitamins, minerals and fibre. Starchy food should make up just over a third of the food we eat. Choose higher fibre wholegrain varieties, such as wholewheat pasta and brown rice, or simply leave skins on potatoes. There are also higher fibre versions of white bread and pasta. Starchy foods are a good source of energy and the main source of a range of nutrients in our diet. Milk, cheese, yoghurt and fromage frais are good sources of protein and some vitamins, and they're also an important source of calcium, which helps keep our bones strong. 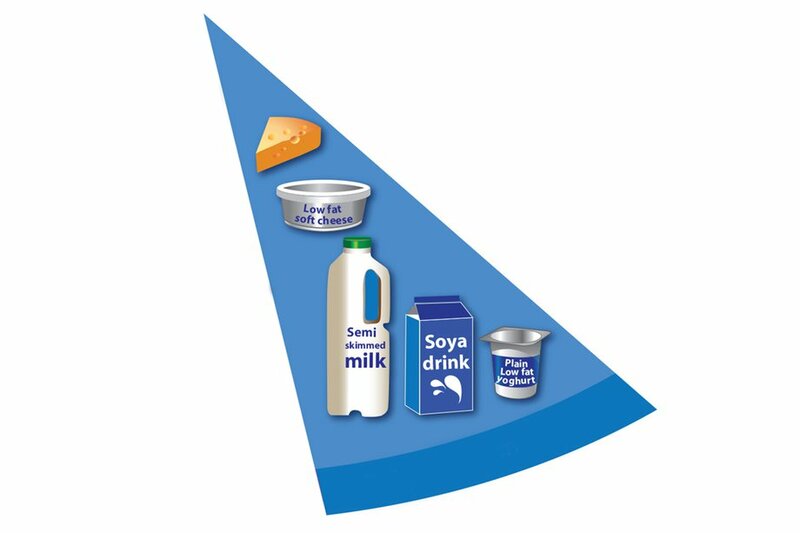 Try to go for lower fat and lower sugar products where possible, like 1% fat milk, reduced-fat cheese or plain low-fat yoghurt. These foods are good sources of protein, vitamins and minerals. Pulses, such as beans, peas and lentils, are good alternatives to meat because they're lower in fat and higher in fibre and protein, too. Choose lean cuts of meat and mince, and eat less red and processed meat like bacon, ham and sausages. Aim for at least 2 portions of fish every week, 1 of which should be oily, such as salmon or mackerel. Find out about pulses, fish, eggs and meat. 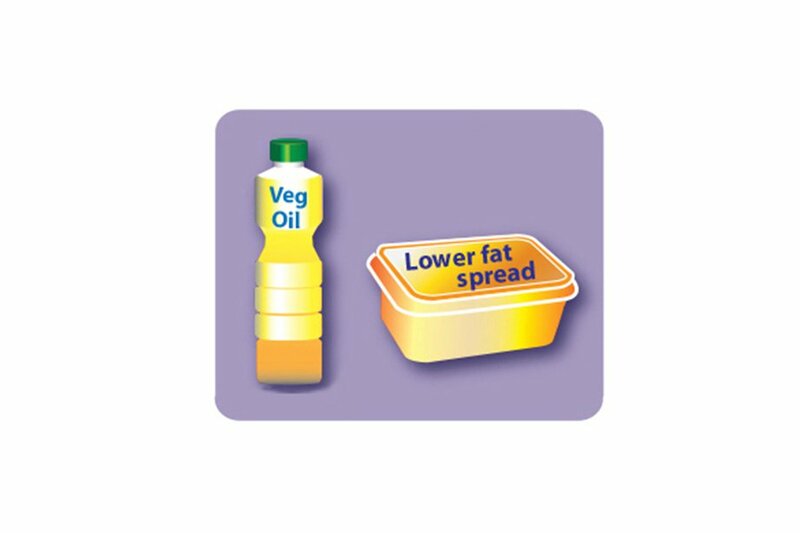 Unsaturated fats are healthier fats and include vegetable, rapeseed, olive and sunflower oils. Remember all types of fat are high in energy and should be eaten sparingly. 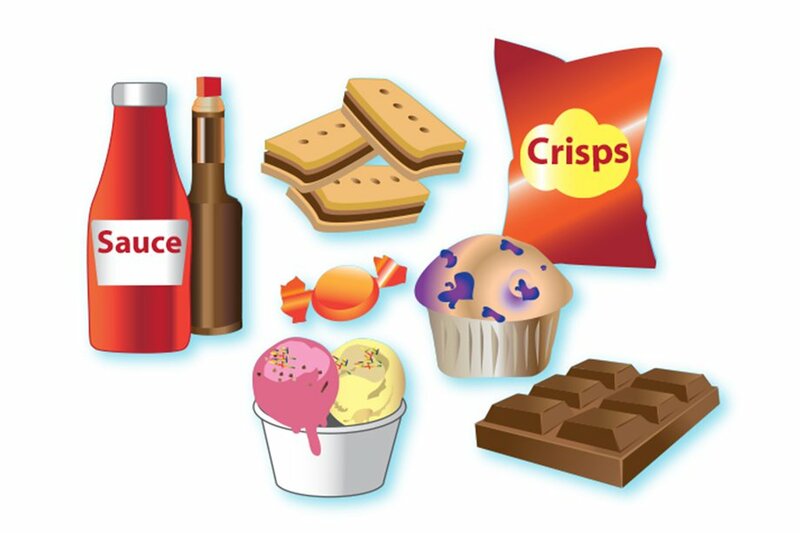 These foods include chocolate, cakes, biscuits, sugary soft drinks, butter, ghee and ice cream. They're not needed in our diet, so should be eaten less often and in smaller amounts. Water, lower fat milks and lower sugar or sugar-free drinks, including tea and coffee, all count. Fruit juice and smoothies also count towards your fluid consumption, but they contain free sugars that can damage teeth, so limit these drinks to a combined total of 150ml a day. How does the Eatwell Guide work? The Eatwell Guide divides the foods we eat and drink into 5 main food groups. Try to choose a variety of different foods from each of the groups to help you get the wide range of nutrients your body needs to stay healthy. 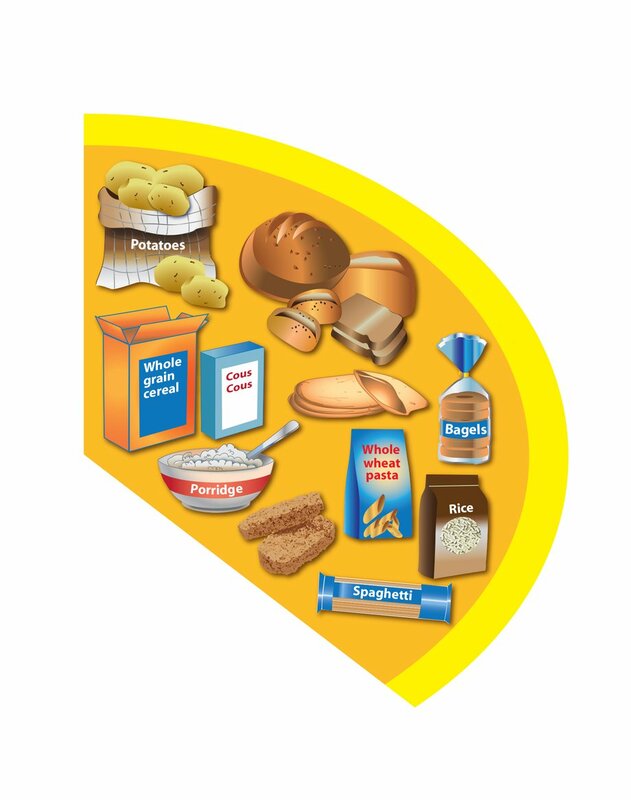 It's important to get some fat in your diet, but foods that are high in fat, salt and sugar have been placed outside of the circular image as they're not necessary as part of a healthy, balanced diet and most of us need to cut down on these. Unsaturated fats from plant sources (for example, vegetable oil or olive oil) are healthier types of fat. But all types of fat are high in energy (calories), so they should only be eaten in small amounts. On average, women should have around 2,000 calories a day (8,400 kilojoules) and men should have around 2,500 calories a day (10,500 kilojoules). Most adults consume more calories than they need. Find out how food labels can help you choose between foods and pick those lower in calories, fat, saturated fat, sugar and salt. Many foods, such as pizzas, casseroles, pasta dishes and sandwiches, are combinations of the food groups in the Eatwell Guide. With these meals, check the ingredients and think about how these fit with the sections on the guide to help you achieve a balanced diet. Does the Eatwell Guide apply to everyone? The Eatwell Guide applies to most of us, whether we're a healthy weight or overweight, whether we eat meat or are vegetarian, and no matter what our ethnic origin. Anyone with special dietary requirements or medical needs might want to check with a registered dietitian on how to adapt the Eatwell Guide to meet their individual needs. The Eatwell Guide does not apply to children under the age of 2 because they have different nutritional needs. 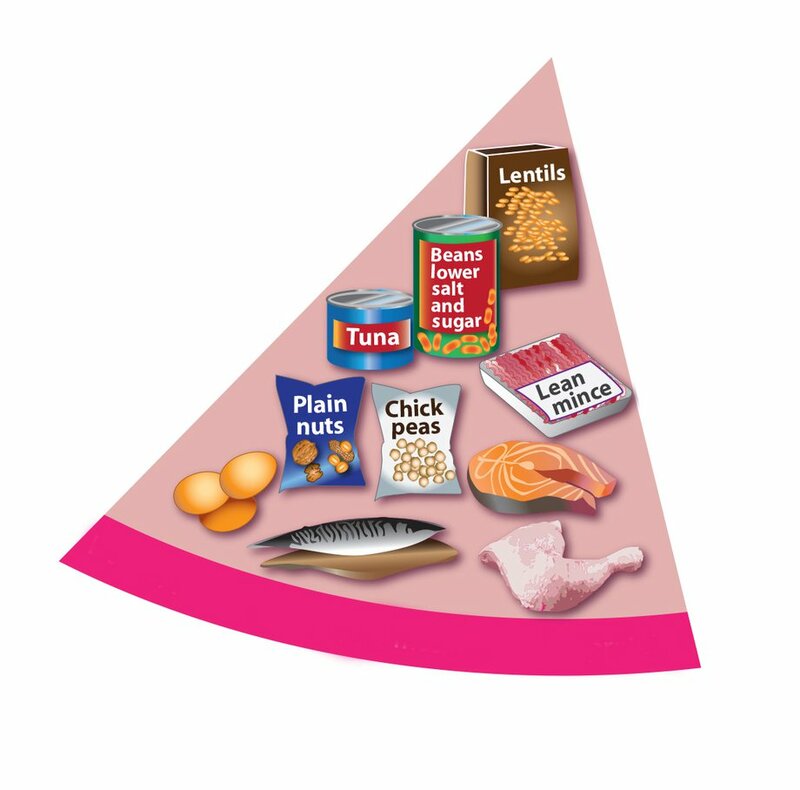 Between the ages of 2 and 5, children should gradually move to eating the same foods as the rest of the family in the proportions shown in the Eatwell Guide. Read more about babies, toddlers and young children's nutritional needs in Your baby's first solid foods. For more information, including details of which foods are included in the food groups, download Public Health England's booklet about the Eatwell Guide from GOV.UK. Got a question about the Eatwell Guide? Email the Eatwell Guide team at Public Health England: phe.enquiries@phe.gov.uk.